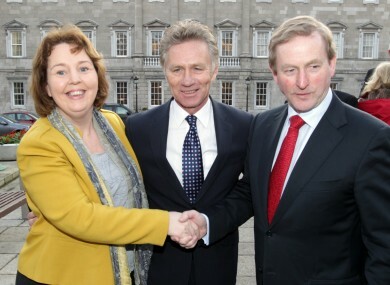 Senator van Turnhout (left) with Seanad colleague Eamonn Coghlan and Taoiseach Enda Kenny last year on the day Coghlan joined Fine Gael. SENATOR JILLIAN VAN Turnhout is in discussions with Fine Gael over the possibility of joining the party to run in the European elections next year and fill the seat being vacated by Gay Mitchell. TheJournal.ie understands that preliminary discussions have taken place over the possibility that the former head of the Children’s Rights Alliance, who was appointed to the Seanad by Taoiseach Enda Kenny in 2011, would join the party and run for the Dublin seat next year. Mitchell announced that he would not be contesting the next European elections earlier this month and a number of party members including two senators, a TD and Dublin’s Lord Mayor have emerged as possible successors. However, van Turnhout is also positioning herself as a possible candidate. It is understood that discussions over the matter will not be advanced until after the Meath East by-election which takes place next Wednesday. Van Turnhout did not wish to comment when contacted by TheJournal.ie this week. Van Turnhout has previously been a member of the European Economic and Social Committee (EESC), a consultative body of the EU which represents employers’ organisations, trade unions and other interest groups at a European level. During her time on the EESC she was on the steering group of the EU Forum on the Rights of the Child and she would be seen as a key advocate for children’s rights at a European level if selected and elected to the European Parliament next year. Her Seanad colleagues, Fine Gael’s Catherine Noone and Eamonn Coghlan, are also said to be in the running for Mitchell’s seat with rebel Fine Gael TD Peter Mathews and Dublin’s Lord Mayor Naoise Ó Muirí also in contention. As a result of Croatia’s accession to the EU, the number of MEPs representing Ireland in the European Parliament will be reduced from 12 to 11 next year requiring a redrawing of Ireland’s European constituency boundaries. It is not yet clear what effect this will have on Mitchell’s Dublin constituency as it is currently constituted. Explainer: How will constituencies change now that Ireland’s losing an MEP? Email “Van Turnhout in discussions with Fine Gael over filling Mitchell's MEP seat”. Feedback on “Van Turnhout in discussions with Fine Gael over filling Mitchell's MEP seat”.